Largehearted Boy: Book Notes - Chris Bachelder and Matt Weiland "The Throwback Special"
Book Notes - Chris Bachelder and Matt Weiland "The Throwback Special"
Chris Bachelder's novel The Throwback Special is a nuanced portrait of male friendship and ritual. "Powerful, intelligent, and entertaining. . . . Chris Bachelder works a kind of poignant comedic magic, expertly locating and drawing out central truths about life." I have come to think of tone as a kinetic element of fiction. In the absence of grave stakes, a propulsive plot, or a vectored central protagonist, tone can compensate by creating friction and angle and charge. The Throwback Special takes place in a hotel, and I think of the hotel as a container not simply of a large group of men but of swirling attitudes and emotions and dimly understood desires, many of them contradictory and incompatible. My ambition was to occupy a narrative stance that might contain, like the hotel, the swirl and swarm of feeling. When I think of a soundtrack for the book, I think of moody or atmospheric songs that are tonally ambivalent and complicated, songs whose lyrics and music don't line up neatly. Irony can be a killing blade or a cleansing flame, but it needn't be a murder weapon. It can do gentler work. When Morrissey says that it would be a pleasure and a privilege to be fatally crushed beside his beloved in a violent automotive disaster, he's joking and he's very much not joking. It's funny, but it's also stirring and lovely and earnest. He has it both ways. Irony, unlike pregnancy or death, is not an either-or proposition. Can nostalgia be angry? Yes. Yes, it can. I know there are better Husker Du songs, but none I found so impossibly deep as a high school senior. And this one fits nicely with the book: "Expectations only mean you really know / What's coming next, and you don't." Poor Joe Theismann. Poor human beings. The Feelies are savants of atmosphere, and this song drives straight ahead with repetitive force and conviction while simultaneously plunging into uncertainty and bewilderment: "What does it mean? / What can you do about it? / What can you say? / You don't even know about it." The lyrics and Phair's fragilely strong voice manage to contain an entire relationship, perhaps even the entire history of human romantic attachment. This song has anger, bitterness, regret, contrition, affection, regard, deep sadness, tenderness, and pain. It's witty, defensive, aggressive, and vulnerable. It's a confession and an accusation. Phair didn't try to sort out the primary emotion of the song. She was correct in thinking that it wasn't her job. This one goes out to my exceptional editor (and Minneapolis native) Matt Weiland. A bright and merry horn section accompanies the grit and grime ("ashtray floors, dirty clothes, and filthy jokes"). Feel the grand, childlike anticipation and the lonely disappointment—not alternately but simultaneously. I often find that a book I'm editing will have a feeling to it that I relish but can't precisely describe or name. I call this feeling a "sound" because it recalls for me a piece of music, or anyway calls forth the mood some piece of music puts me in. The more particular and insistent the sound, the better the book. But I can't edit a book properly without pinning down that sound, so I frequently stop working on a manuscript to dig through old records and CDs. 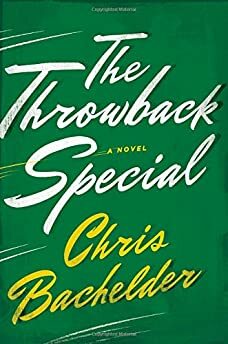 Chris Bachelder's writing, with its blend of wry humor and exceptional sense of the psychic dramas of daily American life, has always been strong music of its own. (Call it Bachelder's "microfine sense of humor and tragic sense of history," as Michael Chabon once did.) I loved The Throwback Special from the very first time I read it, and the sound it made to me was a lovely ache; a regret at time's passage and the lives we leave behind (especially our own) tinged with a simple but deep reverence for beauty in the everyday. "Ain't much to rake anyway in the fall..."
The novel's characters could well have met in the CC Club instead of some crummy hotel off I-95. Is it a coincidence that Tim, the record on which "Here Comes a Regular" appears, came out the year of the Throwback Special play itself? "I don't see, no I don't see, I don't see that girl anymore..."
Bachelder's novel is suffused with the freighted conversation of its characters, much of it awkward answers to awkward questions, and stories about their failed relationships that reveal the people in conversation trying to make sense of their lives. Just like this song from sadly neglected postpunk band the Magnolias ("doomed to be Minneapolis' scruffy also-rans"—Trouser Press). "But where I really excellllll / is at being a failure..."
Nobody but John Darnielle sings better prose faster than Hicks, a hugely talented songwriter and novelist. (A few years ago Hicks put out a superb record, Dylan Hicks Sings Bolling Greene, to accompany his novel Boarded Windows.) I don't know whether I can imagine any of the Throwback characters singing "Renaissance Man," but in my head it's an anthem for them all. Don't miss the great live version of this immortal song on Stuck on AM, the first Radio K anthology. "They kiss when they listen to Brothers in Arms /And if there's something wrong with this, they don't see the harm..."
A 31-year-old man named Sean ("the Ess-Dog") plays in a Sixties cover band and dates an 18-year-old. She leaves for college, the long-distance relationship takes its toll, and it ends (unnoticed except by their dog Trey). Could have been an out-take from the novel. "But I will wait for you /As long as I need to / And if you ever get back to Hackensack / I'll be here for you"
Talk about ache! And time's passage! And regret! Whatever one makes of Katy Perry's cover version a few years ago, she was crazy to call it a love-song; the original is a mighty Song of Innocence and Experience that captures, as William Blake had it, the contrary states of the human soul.